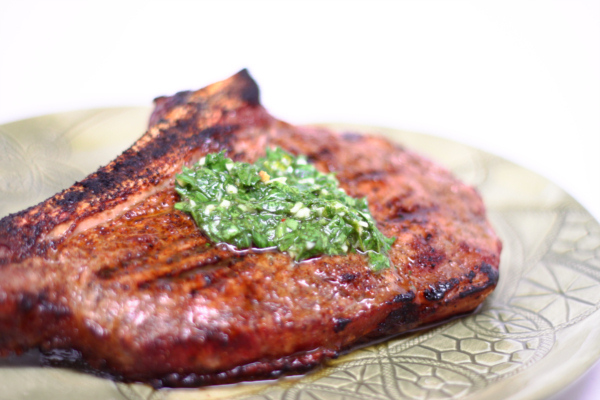 Chimichurri sauce just makes everything better ! 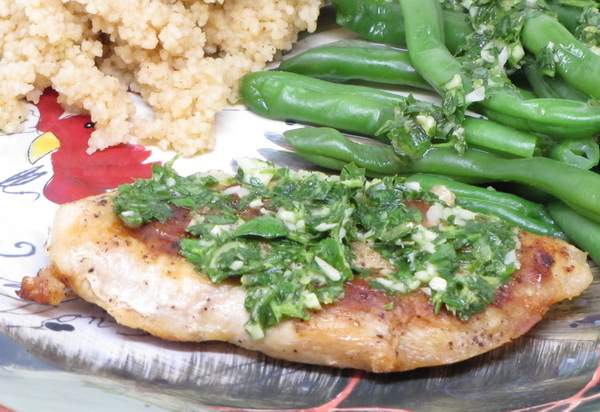 It’s a great mix of parsley, vinegar, garlic and lemon and is much like the Italian gremolata. Serve with some coucous for a great complete meal ! Brush chicken with 1 T oil and sprinkle with half the salt and pepper. Heat grill and cook chicken 12-15 minutes or until done. While the chicken is cooking place beans and water in a glass bowl, cover with plastic wrap and microwave 3 minutes. In a food processor combine 2 T oil, the rest of the salt and pepper, parsley, vinegar, garlic and red pepper and process until almost smooth. Place chicken on bed of beans, with sauce and lemon zest on top. Squeeze extra lemon juice over top and user lemon slices as garnish.